Sasquatch! 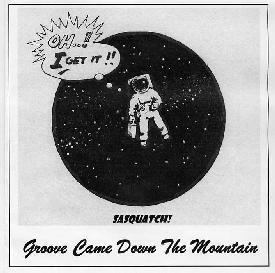 - "Groove Came Down The Mountain"
Sasquatch is a new 3 piece funky psychedelic space band with a bluesy touch. There is also a new German Stoner band with the same name but this is something completely different. Hot Maegus begins the demo CD. It starts with a guitar riff that funks along before the rest of the band joins in. The bass is really lacking in the recording and it has a bit of a tinny sound. The raw vocals are well sung and placed in a strange realm within the sound. This is a band that clearly likes psychedelic music and getting down and funky. A really jammy feel comes across in the music and the guitar of Jonnie Rice is quite experimental at times. Let It Come Down has a really cool wah guitar and soulful stoned bass groove laid down. Ramblin’ Gyro Blues begins with a slow bluesy riff that slowly becomes more upbeat and funky as the song moves forward. The ZZ TOP like heaviness kicks in half way through. Cool track! R.S.I. is a mellow space rocking funk track. I love the spaced out guitar sounds on this one. Excellent stuff! I can’t wait to hear these guys make a really good studio production or live concert recording. Low Down In B Minor brings back the wah blues funk groove again. The CD closes with Drivin’ The Jazzmen, featuring a serious wah guitar workout! A very promising new band. Check out their web site for more info! For more information you can visit the Sasquatch! web site at: http://www.sasquatch-music.co.uk. Contact via snail mail c/o Jonnie Rice; Sasquatch HG; The Cottage; Overfields; Cellan; Lampeter; Ceredigion; SA48 8JF; Wales.